In 1968, Mattel introduced the first 16 Hot Wheels cars and revolutionized the world of toy cars. Fifty years and a few billion cars later, Hot Wheels are still number one. These die-cast cars are a hot collectible and a favorite toy for kids of all ages. 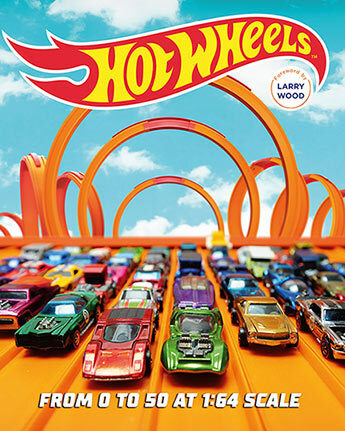 Hot Wheels recounts the story of the world’s fastest toy cars from the initial brainstorm to today’s top models and sets. Officially licensed with Mattel, it reveals why the cars are so fast, how the models are designed, who came up with the logos, and all the detail that has ensured Hot Wheels position as the greatest toy cars ever made. This special anniversary book is highly illustrated including rare design drawings and prototypes from Mattel’s archives as well as fantastic unpublished photos of all of the great Hot Wheels vehicles from across their 50 year history. It’s the perfect vehicle for Hot Wheels fans of all ages! Paul Ruditis is a New York Times best-selling author and pop culture addict who has written companion books for TV shows including The Walking Dead, Buffy the Vampire Slayer, Charmed, Star Trek, and The West Wing. His diverse resume also includes original young adult novels, comic books, and novelty books for all ages. Kris Palmer is a gearhead and freelance writer whose work appears regularly in the Minneapolis StarTribune automotive section and several enthusiast automotive magazines. Palmer also contributed to Motorbooks highly-regarded The Cobra in the Barn and is the author of Dream Garages. He resides in Minneapolis, Minnesota.